Holographic Tall Gift Bags. 6 per pkg (same color). 5" x 3.5" x 14". 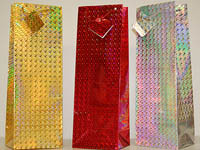 Gift bags in the beautiful holographic pattern that catches the light presenting colors of sparkling prisms. This bag will make your gift even that much more special.